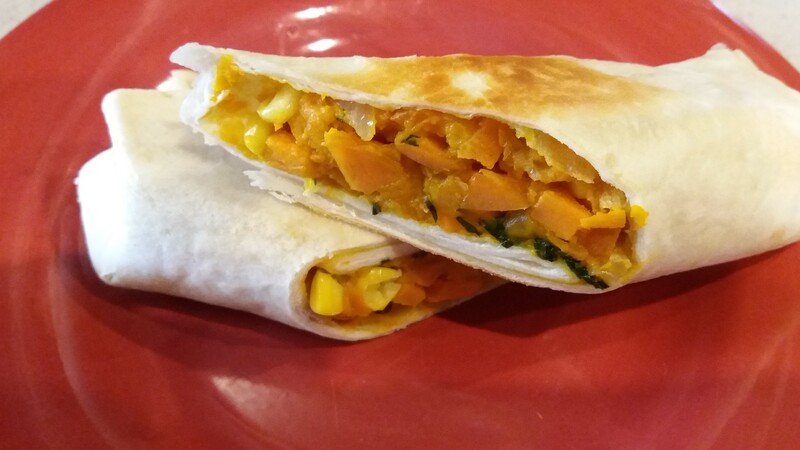 If you enjoy the sweet fall flavors of squash and carrots, you will love this burrito which was a hit at a fall brunch. They went so fast I didn’t even get one myself! The key to this recipe is using a leftover baked squash as it adds the sweet richness to this dish. Heat a skillet on medium heat. When warm, add oil followed immediately by the onion. Add a pinch of salt and sauté until the onion is translucent. Add carrot and sauté 3 to 4 minutes. Add the squash and work the carrot and onion into the squash. Add corn and cook for another minute. Add basil and salt to taste. Cook another minute and remove from heat. Warm each tortilla in a skillet. Warming it will make it easier to fold. Spread out the tortilla and fill with the sweet vegetable filling. Fold into a burrito. I had to learn how to properly fold a burrito but luckily YouTube showed me how! After the burritos are made, heat up a skillet on medium heat, add a small amount of oil and fry the burrito on each side until it is lightly browned. Serve as is or cut on a diagonal and serve half sized burritos.